I’ve finished my next project. 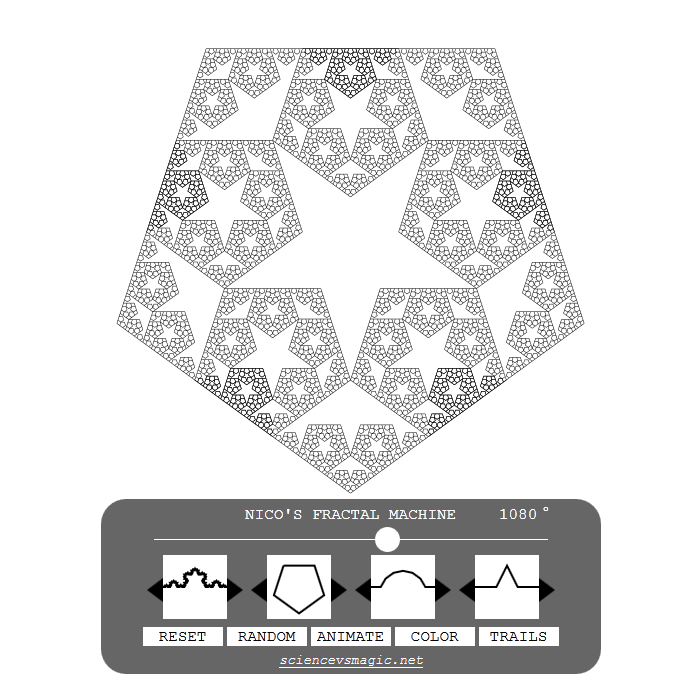 It’s called the Fractal Machine. It’s a geometry tool that draws base-motif fractals from five inputs. If you are unfamiliar with them, fractals are shapes that exhibit self similarity at different scales. This particular type of fractal is created by substituting every line with a shape called the “motif” a number of times. Base changes the base shape the fractal is drawn on. Each side of the polygon will be drawn as one copy of the fractal curve. Segments cuts the motif into more or fewer pieces of equal length. Mirror doubles the protruding part of the motif at every level of the fractal. Depth sets the number of times each line is substituted for the motif. Angle The slider changes the first and last angles of the motif. Any other angles will sort themselves out to be symmetrical. EDIT: In June 2013 I added two new controls, Skew and Arms. Skew Skew the motif left or right. Arms adds new lines sticking out from the corners of the motif. The glyphs above show the controls working in isolation (at an angle of 60°), but the fractal machine’s complexity comes from the way in which they interact. Once these inputs are given, the fractal tries to dynamically resize itself in a way that highlights these relationships. So the length of a single line changes, but the overall size of the fractal and positions of analogous components should be relatively stable. Figuring out the trigonometry that made all this work turned out to be pretty fun. I figure that some people will want to use this to explore human-scale geometric relationships, while other people will just want to turn on the animation, colors and trails and watch it like a music visualizer. Hopefully most people do a little bit of both and enjoy the way one builds into another. One of my favorite things about recursion is that it can let you see simplicity inside complexity. If you want the quick tour, some shapes worth checking out include: The famous Koch Snowflake, something I’ve been calling the Koch Mirror, Sierpinski’s Triangle, Sierpinski’s Carpet, this great pentagon fractal, and this cube snowflake I found. If you find yourself staring at this for a decent amount of time, you might like to know that you can press H to hide the controls and use the keyboard instead. I’ll leave you to work out what buttons do what. This entry was posted in Science by sciencevsmagic. Bookmark the permalink. This tool is awesome, super fun to experiment with! Great work! I was wondering If it would be possible to use an image I got from this as album art for a song? I make electronic music and it would be cool to have one of these for some art. I’ll link your site and/or blog! Hi! Can I use a sketch of your fractal generator for my drawing works? I love your fractal machine. I am using it as inspiration for my own smaller koch curve drawing. You did a wonderful job. This is a really cool tool! Loved playing with the angles in Sierpinski. This is sooo beautiful! I accidentally was looking at the fractals with classical music as the background, it so meditative! 1) if you can tile it on the screen without recalculating the entire fractal. Is there a possibility to extract the graph as a vector graphic, like svg? I would LOVE to be able to export one fractal i made as a vector, is there a way to do it? thanks! There is no way to save a vector output at this time. You might be able to make your browser window really big and then save the canvas to get a higher res image.